Telecoms Package: When rapporteurs betray EU citizens. On both parts of the Telecoms Package, rapported by Malcolm Harbour (IMCO report) and Catherine Trautmann (ITRE report), agreements have been found with the Council of the EU to destroy or neutralize major protections of the citizens against graduated response, “net discrimination” and filtering of content on the Internet. There is little time left, but the Parliament has a last chance with the plenary vote on May 6th to reaffirm its commitment to protecting EU citizens. In the IMCO report by M. Harbour, article 32(a) (former am. 166) protecting against arbitrary content filtering on the Internet, was totally neutralized. On the topic of “net discrimination”, a safeguard that was already very weak (recital 26) was turned into a useless blurb. It’s not a surprise that Harbour gave up to the pressure of the UK government and companies such as AT&T. But it’s a shame for European citizens who deserve their right to communication, information and education, when used through the Internet, to be protected. In the ITRE report by C. Trautmann, amendment 138/46, adopted by 88% of the EP in first reading, and by 40 to 4 in committee last week, was abandoned. This article was crucial for protecting EU citizens against parallel arbitrary justice. Three-strike schemes against filesharers such as the HADOPI law proposal in France are not clearly forbidden by the new compromise. Even though these schemes remain contrary to the due process of law, one will wait years to have it confirmed in front of a court. In this clear attempt to please to N. Sarkozy, C. Trautmann agreed to a major step back in citizens’ rights protection. Citizens from all the EU must phone their MEPs to explain to them how crucial these stakes are for the future of our societies and our economies. MEPs have a chance to correct their colleagues’ mistakes by voting for the “Citizen Rights amendments” package, which includes the original amendments 138, 130 (ITRE), and 166 (IMCO) from first reading, along with clear protections against “net discrimination”, and removal of all remaining traces of “graduated response”. 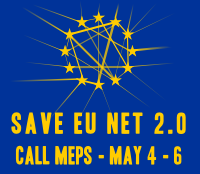 “A few weeks away from the elections, this is the only chance for the Members of European Parliament to correctly protect their electors’ fundamental rights and freedoms over the Internet, against the will of greedy and obsolete industries.” states Jérémie Zimmermann, co-founder and spokesperson of La Quadrature du Net. La Quadrature calls all citizens of the EU to mobilize their friends and networks to be ready to act from Monday 4 May to Wednesday 6 May.